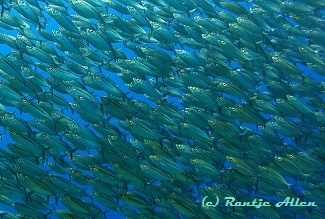 Bigeye scad can form large schools in quiet inshore areas of Gorontalo. For several weeks in October 2016 a large school of Bigeye scad called Olele Bay home. Actually, this is a typical pattern for this fish. Since they hunt for food mostly at night, they gather in large schools during the day. During daylight hours they do not travel much. This was certainly true of the scad found in Olele. With undetectable communication, the fish school moved and changed directions all at once. Their movements and direction showed astounding synchronization. Watch for yourself in the video below. At one point, they swam into the sunlight. Notice how the sunbeams danced around the school of fish. The scientific name of this oceanic fish is Selar crumenophthalmus. It is found in tropical regions worldwide, including equatorial Gorontalo. The local name of the fish in Gorontalo language is “oci.” It is a fast reproducing species and plays an important part in the local diet. One fish is the right size for one person. Other common names in English include Purse-eye or Goggle-eyed scad. The Bigeye scad is considered pelagic since it is associated with the open ocean rather than the reef. In Gorontalo, ocean depths plunge several kilometers just off the beach. That is why pelagic species including whale sharks swim right over the coral slopes of Gorontalo. When they are swimming close to shore, Bigeye scad eat small shrimps, invertebrates and forams. When they are in open ocean conditions, these scad will eat zooplankton and fish larvae. Perhaps you notice them eating in the video. Clearly, they were plucking planktonic morsels from the water. For your chance to see a school of Bigeye scad, please contact with us for a dive package booking. BOOT 2017 in Dusseldorf, Germany, included a large delegation sponsored by the Indonesian Ministry of Tourism. The booth for the tourism ministry at BOOT 2017 proclaimed the theme “Wonderful Indonesia.” Marine tourism operators from all over the country accepted the invitation to promote their various destinations. Miguel’s Diving exposed visitors to Gorontalo, Indonesia’s hidden paradise. A large map of major dive destinations nationwide covered a third of the back wall. The biggest hit with visitors was the coffee shop, specializing in fine Indonesian coffees. Made with a flare by a professional Indonesian barista, all coffees and teas were free. 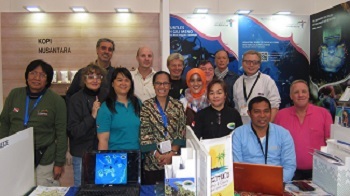 In addition to the ministry booth, three international underwater photographers displayed their photos from Gorontalo. Imran Ahmad promoted Gorontalo exclusively at two photo lectures at the Underwater World stage in Hall 4. Patrick Neumann included his stop in Gorontalo in his travelogue of several Indonesian dive destinations. Finally, Dusseldorf resident Volker Lonz created a dramatic and beautiful short film. This film ran continuously at the Gorontalo table during BOOT 2017. For those who did not get a chance to see it, please access video below. The resolution is low because it is on Youtube. BOOT is the famous boat show of Europe. Mega yachts and ships take up the largest hall. Also included in the expo are dive destinations. They were located in Hall 3. For BOOT 2017, a myriad of destinations world-wide packed into the large hall. The expo stands as the longest one in Europe. This year the dates were 20 to 29 January 2017. As usual, the location was MESSE in Dusseldorf, Germany. Exhibition floor space totaled 22,000 square meters. BOOT 2017 marked the 48st year. The theme “Play Now!” could be seen throughout the halls. Sailing and motor yachts celebrated 70 world primeres. Exhibitors numbered over 1,800 and came from 70 countries. That included the great dive destinations found in Indonesia. In addition to scuba diving, fishing and holidays on the water plus trend sports enjoyed dedicated spaces in various halls.